H2 Life extends to healthy happy life. We believe that Health and Happiness of people encompasses every facet of human existence, directly affecting their productivity, organisational efficiency, profitability and the nation’s overall growth and prosperity. Everything that affects a person’s physical, socio-economic or political environment has a direct impact on their health and happiness. H2 Life Foundation is a not-for-profit organisation focused on public policy and advocacy. We provide a unique and dedicated platform to connect with policy makers, ministers and officials of central and state governments, experts from varied fields, legislators, professionals and youth to come together to build a forum to voice concerns and make recommendations to the highest level of policy making. We excel at creating opportunities for discussion and study of public policies by organising seminars, conferences, workshops and training programmes which are regularly attended by ministers, members of parliament, bureaucrats, diplomats, think-tanks, senior officials of corporates, media and other stakeholders. From discussions to recommendations, government rules to directives, policy to implementation, and regulation to compliance - H2 Life, with your support, aims to work for positive change. Public Policy Advocacy has evolved over the last few decades. The term today encompasses a wide range of activities that help reach out to decision and policy makers. These include capacity building, relationship building, forming networks, and leadership development. It enables organisations to communicate with policy makers and help them make informed decisions. 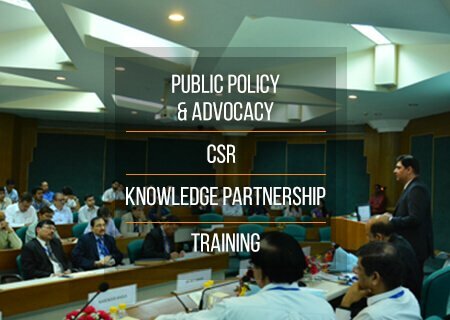 H2 Life Foundation is actively engaged in facilitating discussion on issues relating to Public Policy. We regularly submit recommendations to the highest level of policy making, besides organising workshops, seminars, conferences, and round-table discussions on thematic topics between various stakeholders. We also organise national and international study tours in an effort to approach advocacy with an international perspective so that policies may be viewed in a global context. We at H2 Life Foundation believe in giving back to the society and creating happiness and new opportunities for those who need them the most. Along with working with top government officials we also work at the grassroots level to reach out to those who have fewer opportunities than others by way of awareness campaigns, workshops, and skill enhancement programmes. We help in assessing suitable and impactful CSR programmes for our corporate partners and they are happy to carry out their CSR activities through us given our varied domain expertise, experience and associations. For any organisation, especially those wishing to enter a new market or sector, the need to understand the nuances of the existing laws and policies of that market is paramount. This is where H2 Life Foundation provides strategic support as a knowledge partner. Besides corporates, we are knowledge partners for various Ministries and Government Departments as well. Our team of experts are regularly invited by policy makers to hold discussions and to make recommendations to contribute to the improvement of public policy and the formulation of new regulations. We are also called upon for consulting and designing top level summits and conferences for our corporate partners. 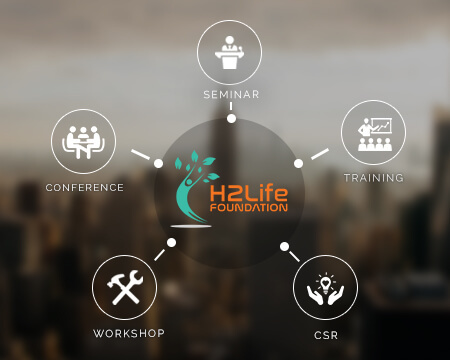 H2 Life Foundation has been engaged in conducting training programmes for corporates and professionals both in the public and private sectors. Our programmes are specially designed for creating awareness, providing interpretation, compliance training and support on new laws and policies. We are also committed to empowering the youth through skill development, so they may have better job prospects and become economically independent.